Stockholm, Sweden - Net Insight, the leading provider of live, interactive and on-demand media transport, has announced its Sye solution has been awarded one of the industry's most prestigious technology honors, the Best of Show Award, at the 2017 NAB Show in Las Vegas. Sye is the world's first true live OTT solution that streams live content with ultra-low delay, synchronized across all screens. Net Insight's Sye enables real time social interactivity and enhances audience engagement. With the addition of Sye 360°, it provides an even more immersive experience on the second screen. The award is given by NewBay Media, the publisher of TV Technology. NewBay's Best of Show Awards are evaluated by a panel of engineers and industry experts, and are selected based on innovation, feature set, cost efficiency and performance in serving the industry. "The solution represents a major breakthrough in terms of how live content is viewed on OTT devices, enabling engaging experiences for the OTT audience," said Per Lindgren, senior vice president of Live OTT at Net Insight. "It also opens up for new ways to monetize your live content, extending your rights offering, and maximizing the revenue for your live content." 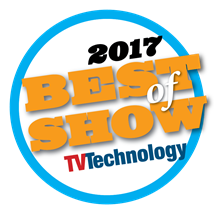 "The products nominated for the Best of Show program, now in its fourth year, provide an outstanding overview of new technology on the show floor and shines a spotlight on the very best," said NewBay Broadcast & Video Group Vice President & Group Publisher Eric Trabb.